For my second stop-in in Portland, I headed over to Dapper & Wise, located on SE Division and 32nd. With a clean and modern space to match their branding, D&W fits right in with the other sleek and simple business scattered on Division. As you enter, you are met with an open and bright room, filled with clean edges, symmetry, and light. It is a perfect place to relax and have a chat with friends, or to zone in and get some work done. Although the name says Dapper & Wise, clearly there is room for all. Barista Maxine Sferra keeps things ordered and clean while waiting for her next customers. Although they take their coffee very seriously, D&W also likes to keep things pretty light-hearted, and they're not afraid to joke around and have fun. In the midst of a generation and culture that can, at times, take itself a little too seriously, this was a breath of fresh air. With a look at their Instagram (@dapperandwise), it's clear that they create eye-dazzling, professional content and manage to have fun while they do it. This mentality carries over into the culture of the shop. In addition to all the classics, D&W offered some of the tastiest and most creative coffee drinks I have had to date. 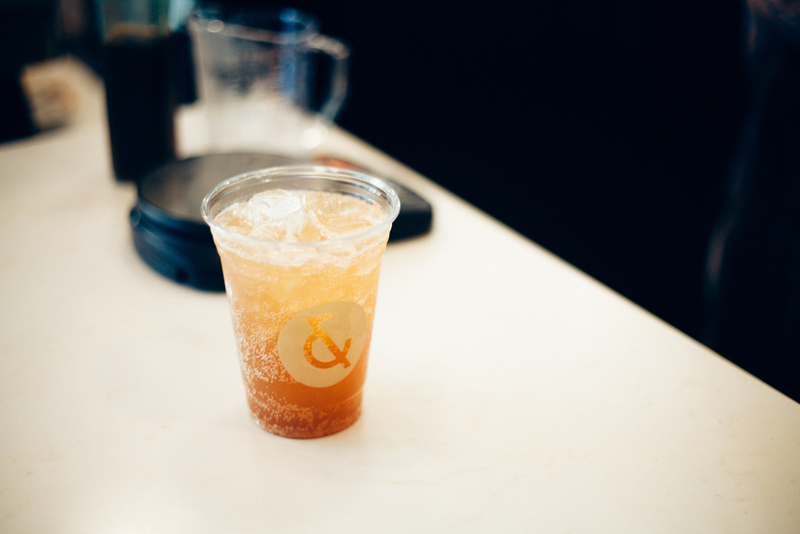 Their newest addition to the menu is a Peaches and Cream Coffee Soda, combining fresh-pressed peach juice, soda water, and coffee. 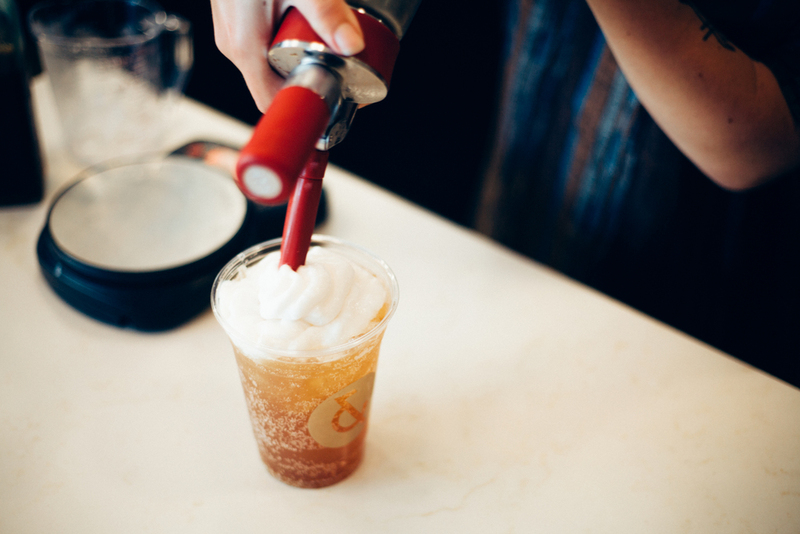 The soda is topped off with a dollop of house-made vanilla coconut foam. If your mouth isn't watering, I think you may need to rethink some things. That drink alone is worth the trip to Portland. Out of all the baristas that I spent time with while shooting for these pieces, the baristas at D&W were (by far) the friendliest and most welcoming. Tylor and Maxine were quick to make conversation and were genuinely interested in who I was and what I was doing in the city. A visit to a new coffee shop can often come with a sense of intimidation and apprehension, not quite knowing where you'll fit in. At D&W, these fears will quickly subside. All are welcomed warmly. Light pours into D&W through its many floor to ceiling windows. Dapper & Wise doesn't only want to bring the experience of good coffee to its customers, they want to invite others into the heart of it. 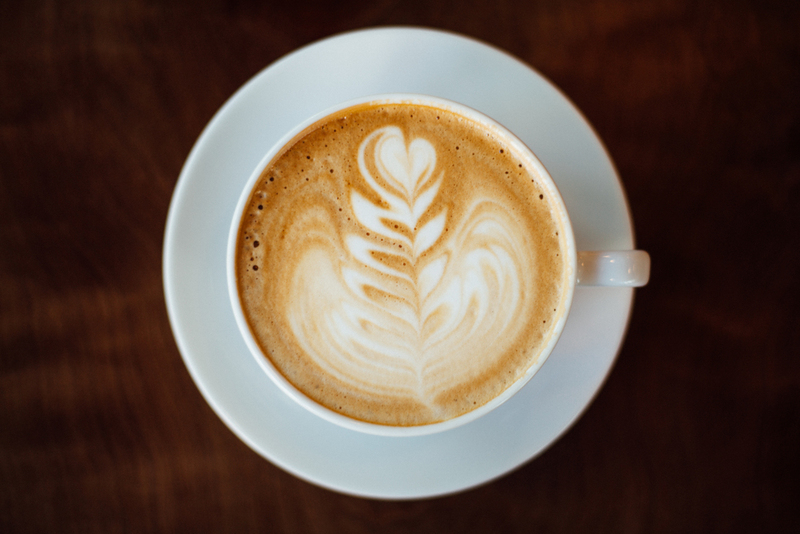 D&W offers a series of educational classes that they call "Coffee School," teaching aspiring brew-masters and beginners alike the art of a good cup from the ground up. Pairing hands-on learning experience with weekly reading assignments, Coffee School creates a welcoming and inspiring environment for any attendee. At D&W, they don't just serve good coffee. They roast it, too. Every bean is sourced responsibly. The roastmaster takes great care to make sure the farmers are being paid above the Fair Trade minimum. They are looking for genuine, lasting relationships with their partners. It's a give and take. D&W offers a wide variety of quality merchandise and goods at their Division location. If you feel like repping the brand, there is no shortage on cool and useful swag. Check their store out. 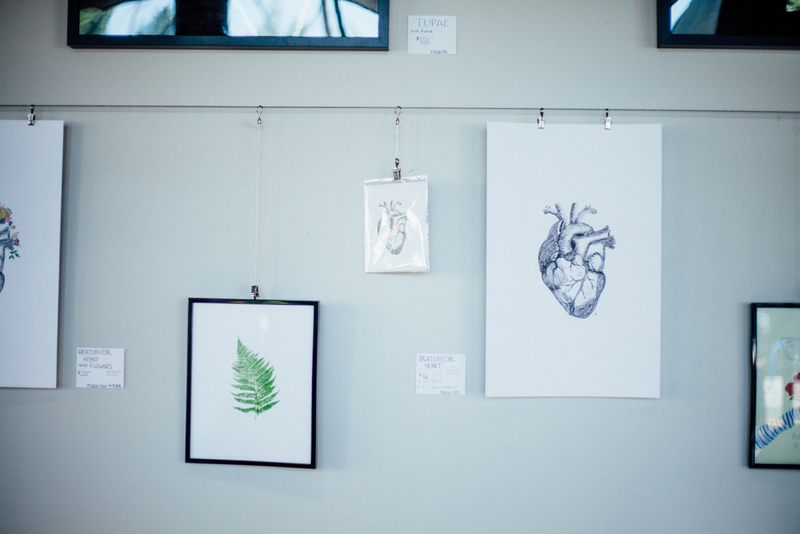 Have you bought your ticket to PDX yet? No? What are you waiting for?? It's people and shops like this that make Portland the great city that it is. Welcoming. Bright. Creative. Hopeful. Eclectic. Excellent. Dapper. Wise. Go on, give them a shot. If you don't love it, I'll pay you back for your plane ticket. As soon as one arrives in Portland, it's evident that this is a city that values quality. Quality in food, in beer, in design, in efficiency, in conversation... And especially, quality in coffee. Listed by USA Today as one of the top ten coffee cities in the world, and the second greatest in America (coming in closely behind Seattle), this is a place where coffee is serious business. If you're going to open a shop here, you need to know what you're doing. Many shops have risen and fallen, each one trying to stand apart, trying to find it's own place amid the merciless competition that capitalism endlessly provides. How can you do it? What do you need to survive and thrive? I believe there are three things that roasters and shops should strive for: excellent coffee (obviously), a purposeful mission, and figuring out how to utilize the qualities that make their particular shop unique. 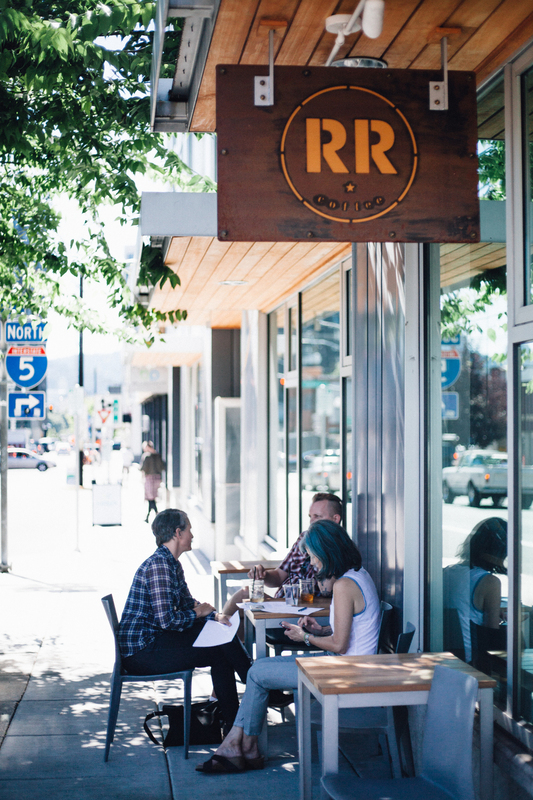 Ristretto Roasters has locations on Couch Street, N. Williams, and NW Nicolai. Each location offers a unique RR experience; these photos showcase the Couch shop. Ristretto Roasters seems to be doing well at all three. Founded 10 years ago by Din Johnson and his wife Nancy, RR has since opened two additional shop locations and become a recognized name in the city. I sat down with manager Andy Beers at the Couch location to hear more about RR and their growing presence in Portland. 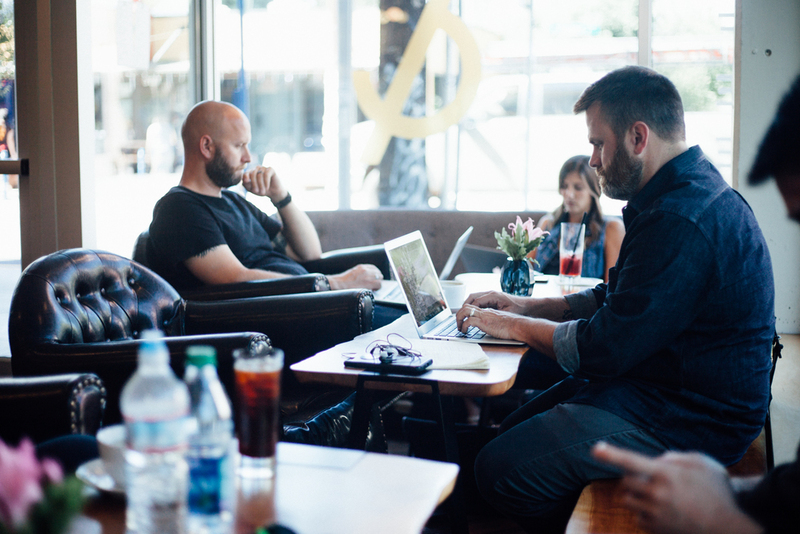 When asked about the driving purpose of RR, Beers stressed the importance of approachability. "Our focus is entirely on dodging the pretentious side of the specialty coffee industry," Beers said. "We've always wanted to be extremely approachable, friendly, and really able to deliver and excellent product to anyone. 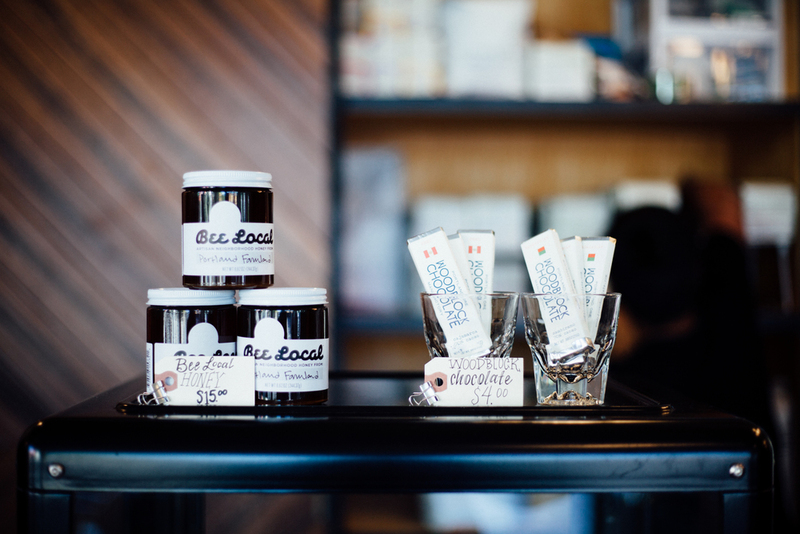 Whether or not they have specialty coffee knowledge, we want them to have a good experience." 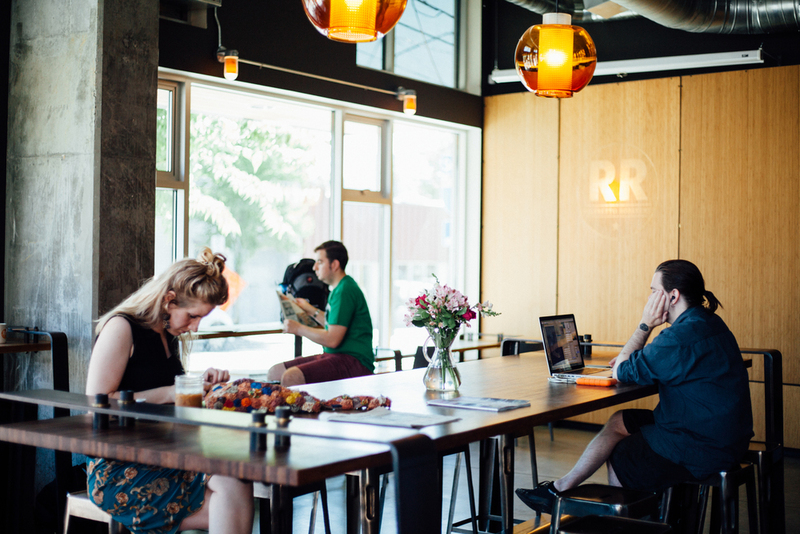 In a city where those with little coffee experience may be looked down on by the snooty barista or the "coffee-cultured" Portlander, RR welcomes all in to educate and serve them well. "If you don't know the vocabulary of the industry and afraid that you're going to be judged for what you say, it can be really scary. 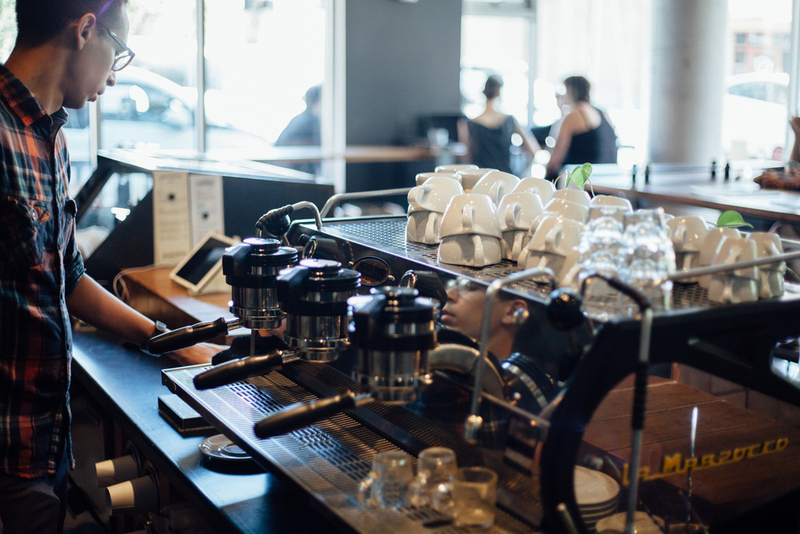 That runs counter to what coffee should be about: talking to people and enjoying something on a visceral level as opposed to a cerebral one," Beers added. Ristretto Roasters certainly does not sacrifice the quality of their product in order to welcome beginners in. 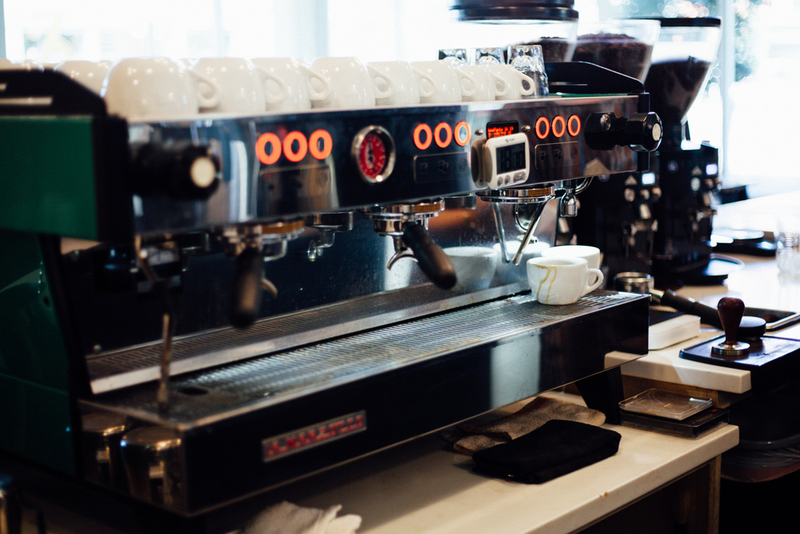 They work hard to serve quality coffee and espresso drinks in a variety of media. At the Couch location, they excel in espresso and milk drinks. 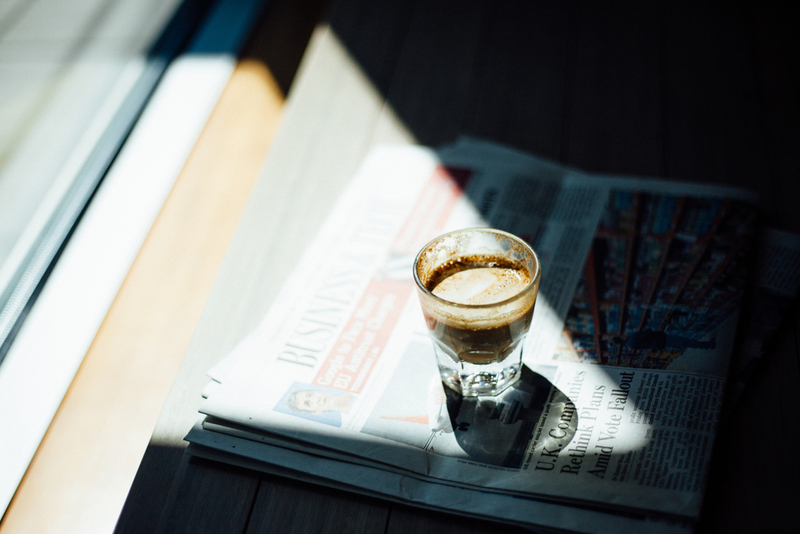 "We pull our shots as double ristretto shots, and they hold their own very well in milk. The way you can interplay the milk with the particular espresso notes..." remarked Beers. "I think there's a world of possibility there." However, espresso is not the only thing they do well. 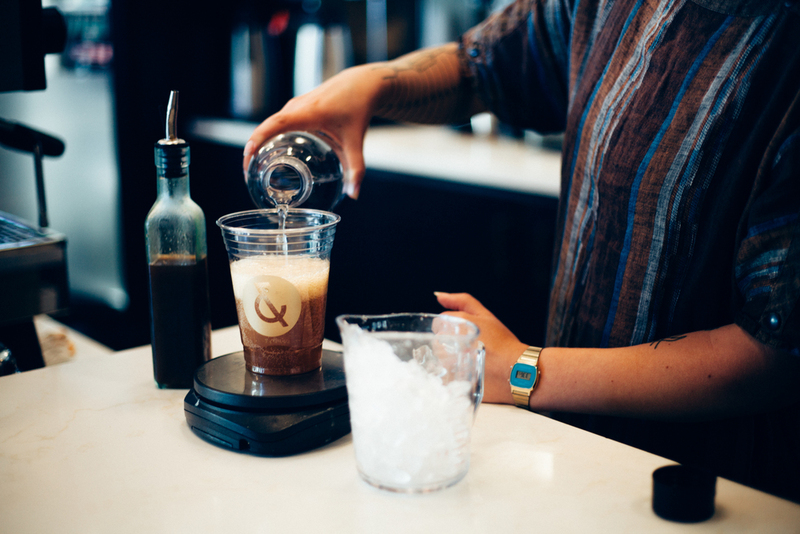 The Aeropress champion of North America happens to be an educator at RR, and each of their locations serves an Aeropress that (literally) is to be reckoned with. In conclusion, Beers once again stressed his mission in the coffee industry to strip away that perceived barrier of pretentiousness. 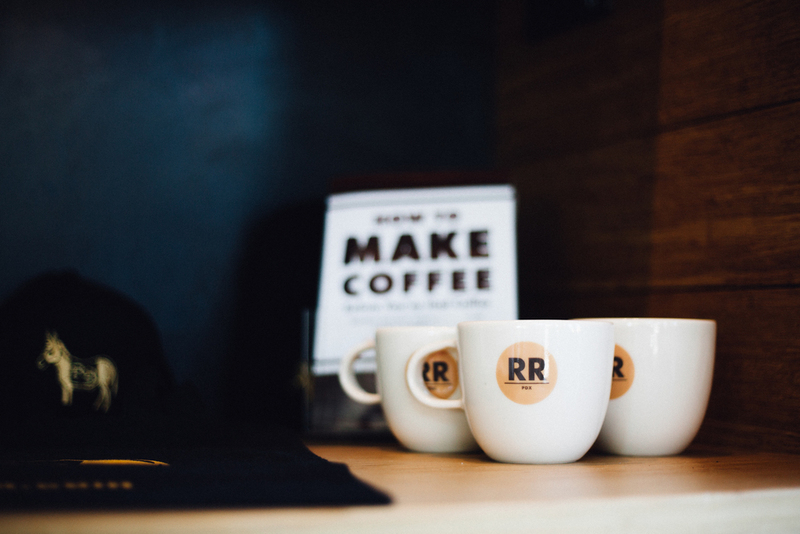 "Everyone should be able to taste good coffee, for what it is, without needing to know anything else; To feel welcomed..."
Walk into Ristretto Roasters, and you will feel just that.